Students will be feeling the love on February 14th on these lovey-dovey campuses. If you think Valentine's Day is worth celebrating, these colleges have you covered. Valentine’s Day is all about love, which is why we think it deserves as much attention as Christmas, Hanukkah and other widely celebrated holidays. We give these five colleges major props for creating fun traditions surrounding February the 14th. Every year on Valentine’s Day, Flagler College’s Phi Alpha Omega chapter hosts a Bachelor Bid. Single female students get to bid on their male classmates, all of who dance, strut and striptease in order to grab the ladies’ attention. The sweetest part? Proceeds from the two-dollar entry fee go straight to charity. These colleges are guarenteed to make you go "awwwww"
Swarthmore College may be on to something with its annual Valentine's Day dance -- who needs an ice breaker when you're dressed like a bumblebee? The all-girls Simmons College holds an annual soiree around Valentine’s Day that gives the ladies an opportunity to grab dates for the night. As exciting as that is, the best part about the event is usually the venue -- past parties have taken place at iconic locations in the Boston area, like Fenway Park, Top of the Hub and the House of Blues. At Alverno College, Valentine’s Day isn’t just about significant others; it’s about family and friends, too. The school hosts an annual Little Sweetheart’s Party, which includes all-ages fun like crafts and cookie-making. Sounds like a saving grace for those who are single! Swarthmore College takes Valentine’s Day seriously -- they don’t have just one tradition; they have several. For starters, they’ve taken Washington University in St. Louis’ Screw Ur Roommate theme and turned it up a notch. In this version, students dress their roommates up in crazy costumes and send them to the dining hall, where they’re meant to search for the guys and girls wearing the other halves of their costumes (think Romeo finding Juliet or a dog finding a fire hydrant). Swarthmore doesn’t stop at that, though -- the school’s all-male a cappella group serenades the campus with romantic tunes, and students even host a Valentine’s Day-themed comedy show. 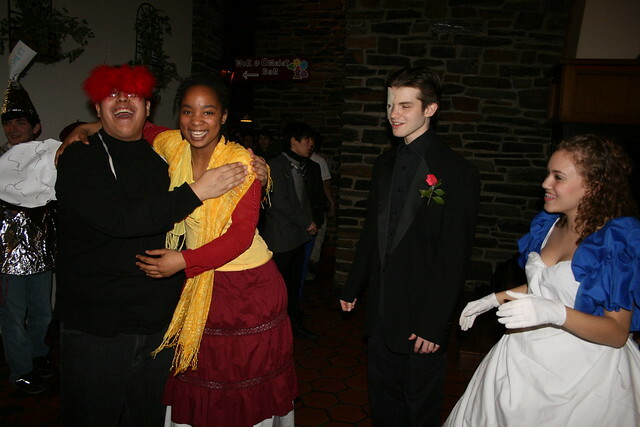 Another Swarthmore tradition is the re-enactment of the St. Valentine's Day Massacre. Cute! Say “aww” if these schools have totally won you over (like they have us)!